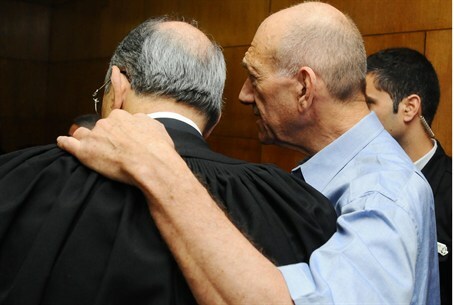 The Jerusalem District Court found Olmert guilty on charges of breach of trust but acquitted him on double-billing and receiving cash. The Jerusalem District Court Tuesday morning found former Prime Minister Ehud Olmert guilty on charges of breach of trust but acquitted him on more serious indictments of double-billing and receiving cash from American-Jewish businessman Moshe Talansky. In its 700-page ruling, Olmert was found not guilty of illegally accepting more than $150,000 in cash from Talansky and of “double-billing” from Rishon Tours. He had been accused of using the duplicate invoices on travel and pocketing the money after the government paid both bills. Olmert triumphantly told reporters, "There never were any envelopes of cash." The acquittals were viewed by analysts as an "earthquake" that seriously damaged the image of government prosecutors as well as the media, whose coverage was slanted against Olmert. The “Investment Center” charges of breach of public trust, on which he was found guilty, are less serious than the Rishon Tours and Talansky indictments and concerned conflict of interest in an investment deal by giving favorable treatment to companies run by a former business partner. The conviction makes Olmert the first prime minister in Israel to have been convicted of breach of public trust. He can be jailed for the conviction, but the sentence will be handed down at a later date. "We decided to acquit the defendant of the [two] indictment charges because there is doubt about his guilt," said the judges. Shula Zaken, who was a senior aide to Olmert, was found guilty on two charges. Olmert’s defense burst out in cheers when hearing of the acquittal on two of the indictments. The former prime minister still faces trial on allegedly bribery in issuing building permits for the Holyland apartment complex when he was mayor of Jerusalem.